“Awake Herbal Vitalizing” line (ageing care line) is now “Awake Hydro Vitalizing Skincare” line, I am sure. Guess Awake Herbal Vitalizing Feel Hydrator is now, Awake Daily Glow Liquid Hydrator. Previously, the “Herbal” line were attractive for me, but it was true that my skin is too sensitive to use. I had done no plan to use new formula of the skin care, but the Awake “Shot” are nice for me, and also they are pretty often asked. I had decided to buy a trial (sample) kit to know with hesitating, but after using this “Daily Glow Liquid Hydrator”, I changed my mind. It is a nice lotion. When I opened the package, I found something “bitter” scent, it reminded me grapefruits peal’s essential oil or something, just checked the ingredients, there are neither grapefruits or orange kind oils/ essences. It can be from the perfume and Castor oil, they have. The lotion/ toner is runny, and they insist oils are dissolved, but seems there are no oils drops, probably oils are dissolved to Alcohol. I am quite sensitive for the products with Ethanol/ Alcohol, I often feel sting with products with Alcohol/ Ethanol (like Albion Skin Conditioner Essential). The good point is there are no sing nor sensation. Sometimes “natural”, “organic” and “herbal” skincare items are too strong and give me sting or sensation, but in this 2018 formula of Awake, they insists “botanical”, but neither “natural” nor “organic”, it can be better for my skin. It moisturized my skin pretty good. Seems this blue “Hydro Vitalizing” are for the firming/ lifting or make our tired skin supple, fortunately still my skin’s suppleness is 20s level, and it is not so much tired. I felt it is quite nice product for me, but I do not know if you are oily. I am in the dry season of the mid of the Winter, I am in the warm air-conditioned room for a day, or walking under the dried wind, both inside and outside, there are no humidity. My general skin condition is dryness, and the climate of the season is definitely “dry”. Currently, there are so “MANY” skincare products what are waiting for my reviews, this Awake Daily Glow Hydrator is the first line to be bought. 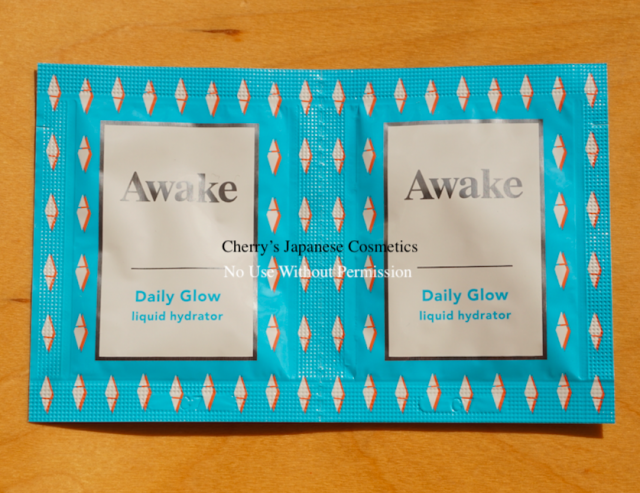 Please check the latest price, and order from here: Awake Daily Glow Liquid Hydrator. Here is the Ingredients list what I copy and paste to Google Translation, the purpose is only for your helping your understanding.